Driving shoes have been shoes that only the sussed in the scene have cottoned on to. There's hardly any brands out there that do nice ones, ones that don't make you look like a tory off on a boat trip... Pretty Green released a model in 2013 of which I have two pairs and they fit the bill also Togs did some nice ones too but that's about it. Anyway fast forward to the present and take a look at the superb 'Sant Agnello' designed by Bax and the team over at DJ. Inspired by the rolling Italian hills and the tucked away shoe shops of the small hillside towns that inhabit those areas they're a shoe with real class. They're a driving boot. You get that? A driving boot and they're proper stunning. I've never seen a shoe of this kind before. 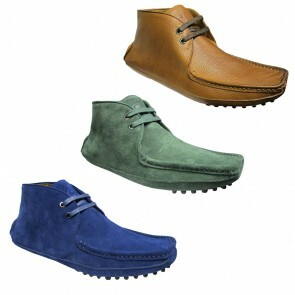 They a hybrid of a colourful italian desert boot and a classic driving shoe. They're a serious stroke of genius in the footwear stakes these and provide your outfit with that much needed euro-centric edge going into the summer months. With a choice between suede and leather DJ have got you covered for those dry days and days when summer showers are inevitable. These shoes are ridiculously comfortable and look great with both jeans and trousers and even cords! They're a really versatile item and are sure to become a menswear classic. No one has dared to try to create a driving boot before and Bax and DJ have taken one small step for man and one big step for the future of men's footwear. The Sant Agnello provide the wearer with that ability to turn heads when you walk in the boozer. There's no greater compliment among men when you get a nod/look directed towards your footwear. The Sant Agnello take the traditional driving shoe bobble sole which adds to the spring in your step. The leather and suede the shoes are constructed with is top draw as with ever other pair of DJ shoes I have owned/tried on. The Sant Agnello are already proving very popular among the sussed society with the likes of Paul Weller, Steve Cradock, DJC and Russel Hastings all donning pairs recently. They're a shoe that can set an outfit off instantly and turn heads with every step. These shoes are a brave, bold new step for the brand as a whole and are sure to be big on the scene! Get involved before they're all gone. Have a butchers at them here!